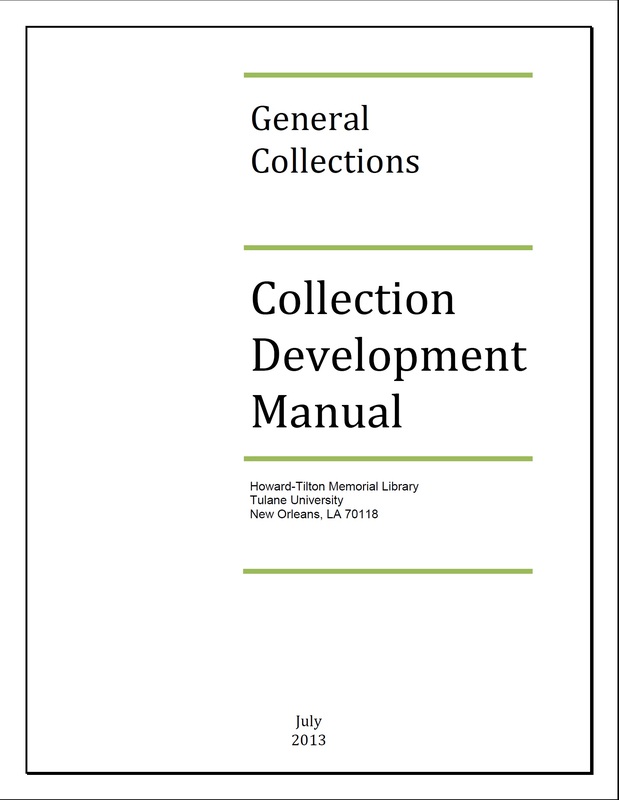 Collection development for the general collections of Howard-Tilton Memorial Library is a program described through the library's Collection Development Manual (click on the image below) and its subject area collections policies. The manual is updated periodically by a Collection Management Group comprised of the Associate Dean of Libraries, three Coordinators for Scholarly Resources, the Director of the Library American Library, the Director of Technical Services, and the Head of Acquisitions. The policies are comprehensive sets of statements about how materials are collected for each discipline, in a framework designed to reflect the academic department and cross-departmental academic program structure of the university. They are regularly updated by liaison librarians assigned to each academic department. The Collections Group meets monthly and its purpose is to communicate important campus or library news and to discuss ongoing collection development activities, planning, and special projects. This group includes all librarians with general collections responsibilities as well as department and unit heads from related areas in Special Collections, The Latin American Library, Technical Services, and User Services and Library IT. The meeting is led by the Associate Dean of Libraries. Summaries of these monthly meetings are routinely distributed to the html-l@tulane.edu listserv for all librarians and staff.